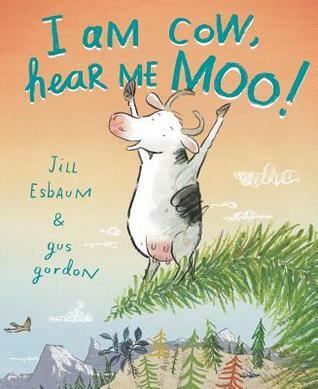 Celebrate today with two mmmmoooooor picture books! ‘Farmer Brown has a problem. He has cows who like to type. All day long he hears Click, clack moo. 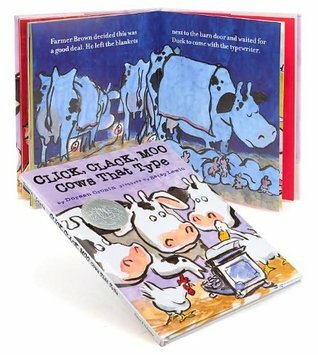 Click, clack moo. Click, clack moo.’ The cows demand electric blankets to keep warm at night. If Farmer Brown refuses to meet their demands, the cows are going on strike. The next day, Farmer Brown gets another note, the chickens will strike if they don’t get electric blankets as well. Farmer Brown retaliates with his own note, no blankets! Duck is sent to deliver Farmer Brown’s message. The cows negotiate blankets in exchange for their typewriter. Farmer Brown agrees. Now the cows and the chickens are happy. But the ducks write their own letter demanding a diving board for their pond! Nadine is a cow who is not afraid of anything, even going into the woods. But when it gets dark and she gets lost, Nadine isn’t so brave. When she accidentally finds her friends, Starla and Annette, Nadine is ready to go home. The only problem is Starla and Annette think Nadine is a hero. Now Nadine has to go back into the woods or reveal her true character. For the full review of this book see my post below.